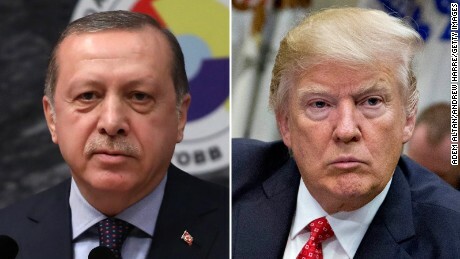 Trump and Turkish President Recep Tayyip Erdogan have discussed Brunson’s imprisonment “on several occasions,” said Sanders, who added that the US President is “not happy with Turkey’s decision not to release” the pastor. The US Treasury announced that the US is sanctioning the two Turkish officials, Minister of Justice Abdulhamit Gul and Minister of Interior Suleyman Soylu, for their role in Brunson’s arrest and detention. Secretary of State Mike Pompeo is expected to meet with Cavusoglu on Friday in Singapore and US European Commander General Curtis M. Scaparrotti is in Ankara this week for meetings with his Turkish counterparts. “The Turkish government refused to release Pastor Brunson after numerous conversations between President Trump and President Erdogan, and my conversations with Foreign Minister Cavusoglu. President Trump concluded that these sanctions are the appropriate action,” Pompeo said Wednesday. The “unjust detention” must end, State Department spokesperson Heather Nauert added. “Turkey knows our position well. This has gone on far too long,” she said. Brunson was arrested in 2016 during the Turkish government’s crackdown following an attempted coup. In March, he was formally charged with espionage and having links to terrorist organizations. If convicted, he faces up to 35 years in prison. He maintains his innocence. Following his move to house arrest, Trump and Vice President Mike Pence threatened to impose “large sanctions” if Turkey did not return Brunson to the US. CNN’s Michael Callahan, Gul Tuysuz and Ryan Browne contributed to this report.